Every year Lupine Adventure is involved with hundreds of successful Duke of Edinburgh’s Award expeditions. We have extensive experience supervising and assessing Gold expeditions from as far north as the Scottish Highlands, to the Yorkshire Dales, Lake District, Snowdonia, Peak District, Brecon Beacons and as far south as Dartmoor. 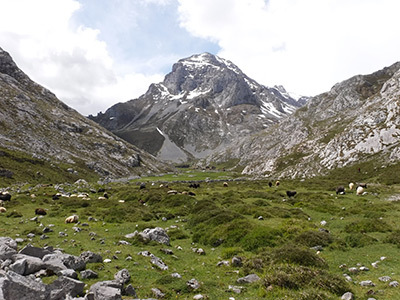 In 2014 we started developing our provision of international expeditions and have run successful expeditions in the French Alps and to the Picos de Europa in northern Spain. We believe that international DofE expeditions are a great way of fostering resilience, confidence, cultural awareness and language skills. They also expose young people to the possibilities of low impact travel through amazing and challenging landscapes. We can offer international expeditions to many venues in Europe but have particular experience in the following two areas. Situated in the beautiful French Alps and at the foot of Mont Blanc (4808 m), Chamonix is without doubt the outdoor adventure capital of Europe and is a perfect base for a Gold DofE expedition. These are our top five reasons for choosing Chamonix and Lupine Adventure for your Gold DofE expedition. 1. The breath-taking mountains and glaciers of the French Alps are food for the soul. The summit of le Brevent (2525 m) provides the perfect viewpoint for taking in and photographing magnificent Mont Blanc. The historic Col de Balme (2195 m) on the border between France and Switzerland is both a great wild camping spot and the perfect place to watch the evening light on Mont Blanc. 2. 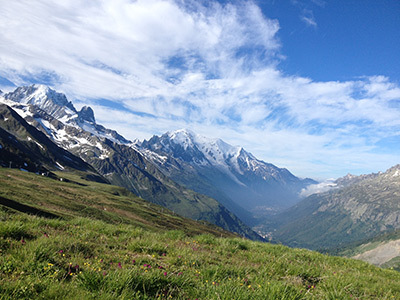 There are hundreds of kilometres of well-marked and well-maintained trails and paths around Chamonix and nearby valleys. A mix of forest tracks and open mountain paths provide lots of scope for planning great routes. This mix of trails and paths allows groups to plan great routes and great weather alternatives. 3. Your group will have plenty of camping choices, both wild and official. If your group wishes to wild camp during their expedition our staff will guide them in picking appropriate sites. We do this based on our experience of camping in the area. Lupine director Dave Lyons has been on multiple camping/trekking trips to the area. On his most recent trip he walked the 170 km long Tour de Mont Blanc staying at campsites and wild camping along the way. We use the popular and friendly Mer De Glace campsite in Les Praz as the base for Lupine expeditions. It has really friendly, helpful staff, good coffee, a daily delivery of fresh bread and croissants and great views up into the mountains and glaciers. 4. Chamonix and the French Alps are easily accessible for a group travelling from the United Kingdom. Budget airlines such as EasyJet fly from Manchester, Gatwick, Luton, and Bristol to Geneva. From Geneva Airport there are regular and quick bus connections to the centre of Chamonix. It is also possible to travel by train or coach from London. We will work with you to arrange the best transport option for your group. 5. It is an affordable destination for an international DofE expedition. We will work out an exact quote for you based upon your location and numbers of participants. Lupine is a not for profit cooperative. We strive to offer good value and make all our expeditions as affordable as possible. Located a short drive from the city of Santander, the Picos de Europa National Park is simply stunning. Potes, a traditional market town is the gateway to the national park and its campsites provide a great base for Gold DofE expeditions. These are our top five reasons for choosing the Picos de Europa and Lupine for your Gold DofE expeditions. 1. 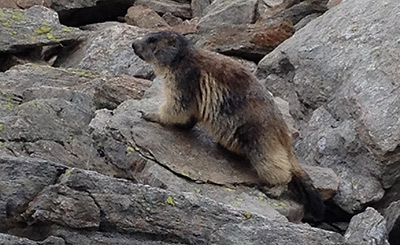 The Picos is world famous for its wildlife. From meadows coved in wildflowers to bears, wolves, vultures and wild cats it is a taste of wilderness. The flora, fauna and geology provide lots of possibilities for successful projects. 2. 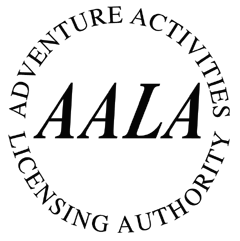 There is an extensive system of well waymarked and mapped trails for your groups to use. Through ancient woodlands, across mountain passes and along magnificent rivers these trails provide challenging but achievable routes. The trek through the deep Cares Gorge will be a highlight of this expedition. 3. Your groups will have a choice of a mix of campsites and wild camps to choose from. Lupine director Dave Lyons is a regular visitor. He is next due to visit in June 2017 when he will be climbing lots of the peaks and checking out potential new wild campsites and routes for groups. 4. There is a good mix of travelling options from the UK. Budget airlines EasyJet and Ryanair fly from a range of airports such as Manchester and Stansted to Bilbao and Santander. If you want to travel by minibus then you can also get the ferry from Portsmouth to Santander. We would then use local buses to travel to the town of Potes. We will work with you to arrange the best transport option for your students. 5. By booking transport well in advance and utilising local buses we will make this expedition as affordable and cost effective for your groups. We will work out an exact quote for your groups based upon the experience gained during the running of previous dofe expeditions and our own personal travels. You can read reports of a couple of expeditions on our blog. If you would like Lupine to prepare a no obligation quote for Gold DofE expedition to either Chamonix-French Alps or Potes-Picos de Europa please get in contact.